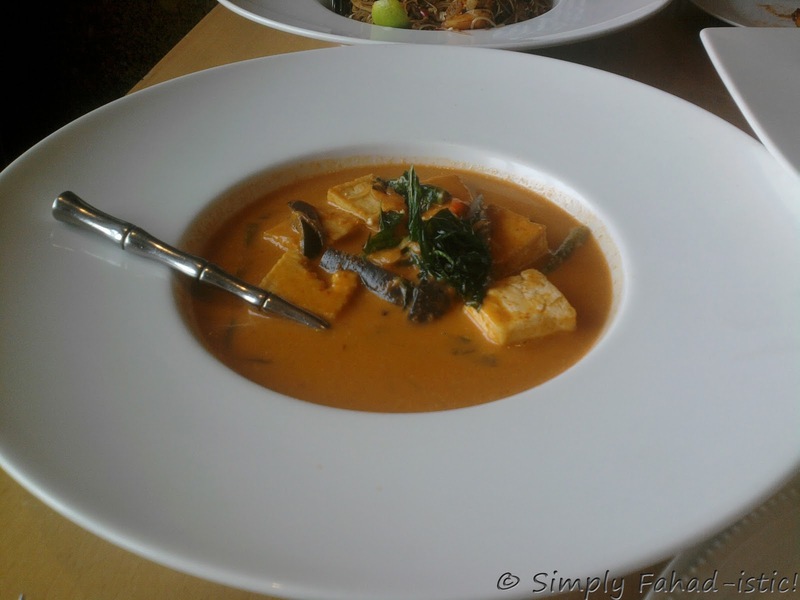 Potpourri Of Flavors: Thai Food - Simply Fahad-istic! You will feast your eyes upon beauteous yellow,red and green curries.Your ears will hear the sizzling sounds of fresh chilies and ginger frying in hot oil.You will smell the aromas emanating from citrusy lemongrass and lime leaves.You will taste sweetness,sourness and saltiness as you experience harmony in its unadulterated form. Someone tweeted the other day "And on the eighth day god created Thai food".If cooking is de-stressing,which I am sure most would agree to,Thai cooking has to be rejuvenating.Almost as good as spa therapy,since it a feast to the senses of sight,smell,sound and taste,Thai cooking has remained closetted for several decades until restaurants all over the world began to reveal the magic of one of the world's finest cuisines.I insist you to embark on this mouth-watering journey,and I promise,each dish will be a gourmet's delight,every day a royal feast! 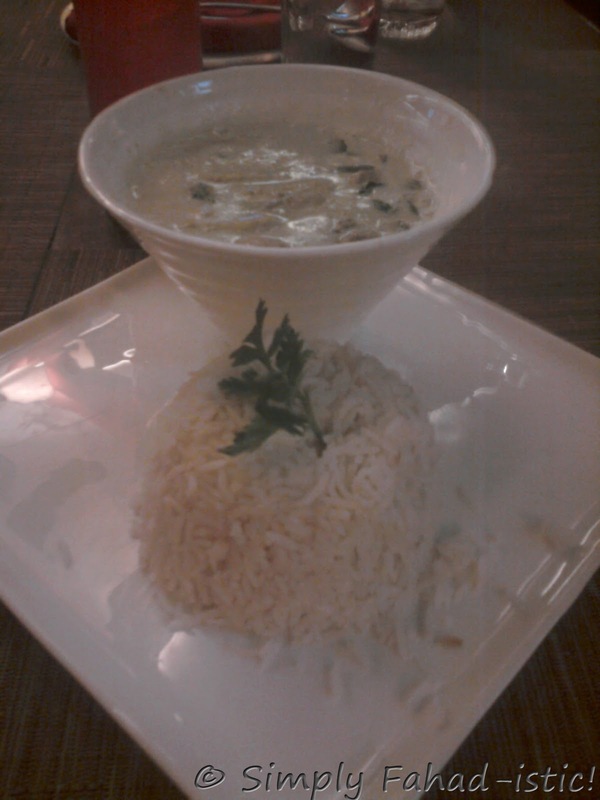 Like all other Thai curries,green curry is best served with steamed rice. The national dish of Indonesia is so irresistible that even Thailand,Malaysia and Singapore have welcomed it with open arms!Though unlikely,but if you are still not sure of trying it,this tender and succulent chicken,grilled to perfection with lemongrass,assorted spices and coconut milk will a be firework of flavors in your mouth.Spicy,sweet and salty,it is served with a smooth as velvet peanut sauce. Soak some bamboo satay skewers in water for atleast thirty minutes. In the meantime,grind the coriander seeds to a powder in a food processor.Alternately,you may use a mortar and pestle.Once ground,tip in the ginger and lemongrass,and blend the ingredients to a thick paste,adding a spoonful of water if required. Transfer this aromatic paste to a mixing bowl,and add rest of the marinade ingredients - turmeric powder,cumin powder,red chily powder,sugar and coconut milk.Mix well and season with salt and pepper.Finally add the chicken strips to this marinade and let it rest in the refrigerator till serving time.This will allow the flavors to intermingle,the chicken to macerate. At the time of serving,thread the chicken onto satay sticks,one chicken strip per stick.Reserve the remaining marinade for later use.Grease the charcoal/electric grill with oil and heat it.Place the sticks on the grill,cook the chicken,brushing it occasionally with the remaining marinade.Allow it to cook for five minutes on each side till it gets a brown and crisp sear.Eat hot with the peanut sauce,close your eyes and visit culinary heaven! Start with half the quantity of coconut milk in a pan on medium-high heat.Once it begins to bubble,add the Thai red curry paste and cook for a minute and a half.Now,put the peanut butter/roasted-crushed peanuts,stirring the sauce constantly as it comes to a boil.Reduce the heat to low and add the fish sauce,tamarind paste and sugar.Give a stir and add the remaining coconut milk.Combine all the ingredients together,taste for seasoning and let the sauce heat through.Switch off the flame and allow it to cool down to room temperature before serving. 1. If you don't have any grill,a grill pan can be used alternately. 2. The coconut milk for the dish,can be fresh,or tinned,or made from a powder - though they all taste different. Try using this recipe with beef,pork,lamb,prawns or even tofu,for a vegetarian version of satay.In case of beef or pork,allow maximum marination time since it is required to tenderize the meat. A preparation that defines Thai food more than any other,is an artistic splash of colors on the plate,a subtle harmony of flavors on the palate.Vegetables and tofu cooked in a red colored - coconut based curry,that is a potpourri of aromas,tastes and textures.The crunchiness of the veggies dwells with the smoothness of the gravy.White tofu,green spinach,purple eggplants and red curry!So,what are you waiting for?Get your apron on and start cooking this piece of art.Go on,and play Mr. Artist! To make your own red curry paste,put all the paste ingredients in a blender except for the oil and blend to a smooth,thick paste.Use no or as little water the chilies were soaked in,as possible.Now,add the oil and blend the paste once again.The oil works as a preservative and increases the shelf life of the paste.Fill in a clean bottle and refrigerate/Use as required. To make the red curry,place a wok on medium-high heat.Once fairly hot,tip in the red curry paste and cook for thirty seconds,stirring constantly.Relish the citrusy fragrance wafting in your kitchen as you add two cups of coconut milk.Mix well and allow it to come to a boil,the oil to surface. Season with soy sauce and sugar,and add the green beans and eggplants.Reduce the heat to a simmer,cover the wok and cook for five minutes,stirring once or twice in between.The vegetables should be soft yet retain their crunch.Stir in rest of the ingredients - remaining coconut milk,tofu,red chilies,spinach leaves and basil.Stir gently,to avoid breaking the tofu.Bring the curry to a boil on high heat and check for seasoning - adding more soy sauce to adjust saltiness and more sugar to adjust sweetness.Serve with boiled rice,if you can resist the temptation of having it right in kitchen! While this recipe specifies quantities for all ingredients,different recipes may recommend different amounts of Thai curry paste,soy sauce and sugar for the same quantity of coconut milk or vegetables.This is for two reasons.First is the strength of curry paste.Various manufacturers might be making curry pastes of varying heat.Even if you make your own curry paste,it might be hotter or milder from that of your peers,since the heat depends upon the variety of chilies used.Secondly,Thai food is largely based on one's taste.We all seem to prefer different levels of sugar,salt and spice in our meals.Hence,while cooking Thai food,the key to make delicious dishes is to keep tasting - and you will never go wrong! Known the world over for their curry,Thais not only make red curry,but also many others like green curry,yellow curry,massaman curry and so on. I adore Thai food - especially chicken satay! And homemade curries are so warm and comforting. Plus I'm a sucker for tofu dishes. These recipes look great! This is so delicious, I've eaten it in Kuala Lumpur. I never knew it can be made at home. Thank you for the recipe! I will make it when we go back home to Sicily. @Ciccia Hi Ciccia! :-) Both the recipes can easily be made at home,and rather quickly too!Thank you for dropping by,and do let me know how do the dishes turn out when you try them. @Now Serving Thank you for appreciating. :-) I am now following you using Google connect.You should be able to see me in your followers list. oh my god...the food looks so scrumptious! I have not ventured in Thai cuisine yet. Food looks delicious. Cool post. Glad to follow you too. Love thai food, chicken satay is so decadent. Very much detailed explanations of the dishes makes it easier for people to try out. Great job fahad. Nice space. I think I can literally live on Thai food for few days straight..its so delicious. Love the red curry recipe..I need to get the ingredients and give it a try soon! I have everything but the lemongrass for your first recipe, have never used it before and should challenge myself to find some and try this...however, if I can't find it - is there any substitution? I'm assuming it has a distinct flavor? BTW, thank you for visiting my blog! Yes,using lemongrass is worthwhile,like most Thai ingredients,it has it's own distinct flavor.However,if you cannot find it or simply do not have enough time,use the rind of half a lemon.Grate it and add it to the marinade,carefully avoiding the white interior which will only result in a bitter taste! I love Thai food. This looks delicious! Thanks for stopping by n your lovely feedback..
nice posts with good presentation.. Thank you for your comments :-). I am glad to see this post. I am enamored with Thai food. I even have gotten Grumpy to eat at a Thai resturaunt, and even he likes it. I'm definitely checking out your tofu recipe on this post. Looking forward to your new posts : ) i want to try this recipe with paneer..will that be ok ? Thank you all for appreciating! Let me know how does it turn out! @Plateful Thank you for the follow. :-) Yeah,Thai flavors are mind-blowing.It is great that you have been to Thailand! Love the plate. I have to add to my list of shopping next time I hit Home Center. Love Thai and this sounds so so delicious. i love thai food and just the description of the above food makes me want thai food right now. Wow! Definitely something I should try!